The climactic tank battle of Kursk spelled the beginning of the end for the Wehrmacht in Russia. With the German Sixth Army destroyed at Stalingrad, the Soviet juggernaut lunged west and southwest across the River Donets. The Soviets seemed unstoppable, recapturing the major city of Kharkov from the Germans on February 14, 1943. However, Field Marshal Erich von Manstein was only waiting for the Soviets to overextend themselves. Once the Soviet armor ran dry of fuel and low on ammunition, Manstein unleashed Army Group South’s riposte. Fresh panzer formations sliced into the startled Soviet flanks, ripping apart two Soviet Fronts (Army Groups). Manstein’s brilliant counteroffensive restored the southern front and culminated in an SS frontal assault and a triumphant recapture of Kharkov. Meanwhile, to the north of the Donets campaign, the Soviet winter offensive was held at bay before Orel by Field Marshal Günther von Kluge’s Army Group Center. Operations everywhere then bogged down to a standstill as the Russian spring thawed the frozen earth and turned it to mud. The thick “rasputitsa” clung to steel tank tracks, to truck tires, to the hoofs of tired horses, and to the boots of exhausted soldiers. The front was left with a gargantuan Soviet salient, 150 miles long and 100 miles wide, bulging around the town of Kursk between the two German army groups. The Kursk salient was consequently the target of the last, great German summer offensive, ending with the legendary tank battles in the environs of Oboian and Prokhorovka. With the third summer of the German-Soviet war approaching, the Red Army war machine had grown more powerful while that of the Germans proportionally declined. Despite Von Manstein’s recent victory at Kharkov, only the most fanatical senior German commanders, along with Hitler, believed that the Soviet Union could be decisively defeated. A stalemate, however, was still in the cards, but only if the Germans managed to retain the initiative. To do so, Col. Gen. Kurt Zeitzler, chief of Army general staff, proposed eliminating the Kursk salient. In what came to be known as Operation Citadel, the Ninth Army of von Kluge’s Army Group Center would strike for Kursk from the north while his Second Army defended the western face of the salient. At the same time, von Manstein’s Army Group South would attack toward Kursk from the south with Colonel General Herman Hoth’s Fourth Panzer Army and General Werner Kempf’s Army Detachment. Once the two German army groups met, the Soviet armies in the salient would be encircled and consequently destroyed. The Eastern Front would be straightened out, allowing German troops to be transferred to the West along with thousands of Soviet prisoners to toil in the Reich’s factories and on its farms. Such were the rewards of victory, and to achieve it Zeitzler counted on the new, vaunted Panther tanks and the Ferdinand or “Elephant” tank destroyer. Germans attempted to reduce the Soviet salient around the village of Kursk, resulting in the greatest tank battle in the history of modern warfare. The Germans attacked from north and south, but were kept at bay after fierce fighting. Hitler presented Zeitzler’s plan to his senior Army commander on May 3-4. VonManstein argued that Citadel might have worked in April, when Hitler first signed the operational order, but now its “success was doubtful.” Field Marshal Walter Model, commander of the Ninth Army, cautioned that the plan was painfully obvious and that the Soviets were already preparing deep and strong defensive positions. Von Kluge, who liked to curry favor with Hitler but was known as a fence sitter, supported Citadel but argued against any further delay, so if it failed he could not be blamed. Col. Gen. Heinz Guderian, the inspector general of armored troops, called the idea “pointless,” certain to result in heavy tank casualties. Furthermore, he made it clear that the Panthers and the Elephants were in no way ready for combat. When Wilhem Keitel, Hitler’s chief of the armed forces high command, later argued for the attack on political reasons, Guderian spat back, “ How many people do you think even know where Kursk is?” Hitler admitted the idea made his “stomach turn over,” but eventually not only decided in favor of Citadel but delayed it for two months until the new tanks were ready. Hitler’s delays played right into Soviet hands. Stalin heeded the advice of Marshal Georgi K. Zhukov, deputy commander of the Red Army, and Marshal Alesksandr M. Vasilevsky, chief of the Army general staff, to postpone a Soviet offensive until the Germans bled themselves dry on the Kursk defenses. And those defenses were awe inspiring. Half a million railcars rolled into the Kursk salient, pouring in division after division. Whole towns in the forward areas were evacuated. Three hundred thousand civilians, mostly women and old men, helped dig trenches and build fortifications. The southern shoulder of the salient alone boasted 2,600 miles of trenches and mine densities of 5,000 per mile of front, laid out to channel the panzers into the crossfire of antitank strongholds. 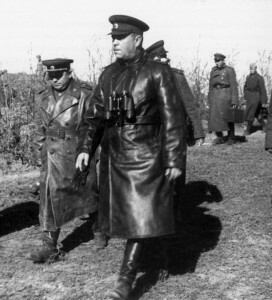 Soviet Marshal Georgi Zhukov, a commander of the Red Army units engaged at Kursk, strides to a meeting with subordinates. To his right is Aleksander Vasilevsky, chief of the Soviet general staff. The 48th Panzer Corps Chief of Staff, Maj. Gen. Friedrich W. von Mellenthin, poignantly summoned up the German predicament: “The Russians were aware of what was coming and had converted the Kursk front into another Verdun. The German Army threw away all its advantages of mobile tactics, and met the Russians on a ground of their own choosing. Instead of seeking to create conditions in which maneuver would be possible … the German Supreme Command could think of nothing better than to fling our magnificent panzer divisions against Kursk, which had become the strongest fortress in the world.” If this was not adversity enough, the Soviets had twice as many men, two and a half times as many guns and mortars, 900 more planes, and 750 more tanks than the Germans. Just before the battle, an SS trooper in the coal black darkness outside of a command bunker thought to himself, “The mud might slow us down but it cannot stop us. Nothing will.” Alfred Novotny, a fusilier of the elite Grossdeutschland Panzergrenadier Division, was of the same mind: “We were totally convinced as soldiers that Kursk would turn the war around again, in favor of Germany. We, the Fusiliers and Grenadiers, would do it!” The high morale was due in part to the fact that the soldiers were unaware of what they were facing. The troops were “prepared to endure any losses and carry out every task given to them,” but “the Russians are masters at the art of camouflage. Inevitably their strength was considerably underestimated,” reflected Mellenthin. Over 2 million men, 35,000 guns, 6,250 tanks and assault guns, and 4,900 aircraft were flung at each other by two merciless totalitarian regimes, each bent on the utter annihilation of its foe. The German attack in the south opened at 3 pm on July 4, 1943, followed 12 hours later by the attack in the north. Forewarned of the exact time of Model’s attack by intelligence operatives, Soviet commanders ordered their artillery to bombard Model’s front lines before his own artillery had a chance to open up. The Germans answered back with air strikes and with a short but intense bombardment. Tiger tanks, Elephant tank destroyers, and Brummbär self-propelled artillery battalions of the Ninth Army smashed gaps into the Soviet defenses and chewed up counterattacks by the Soviet Central Front. Through the gaps poured the panzer and infantry divisions, only to find another of eight skillfully defended defensive belts. Not only were the Soviet defenses far thicker than anticipated, but Hitler’s beloved 89 Elephants, all fighting with Army Group Center, did not live up to expectations. Although their powerful, long L/71 88mm guns proved deadly to Soviet armor, the 67-ton Elephants were underpowered and lacked a machine gun for protection against enemy infantry. 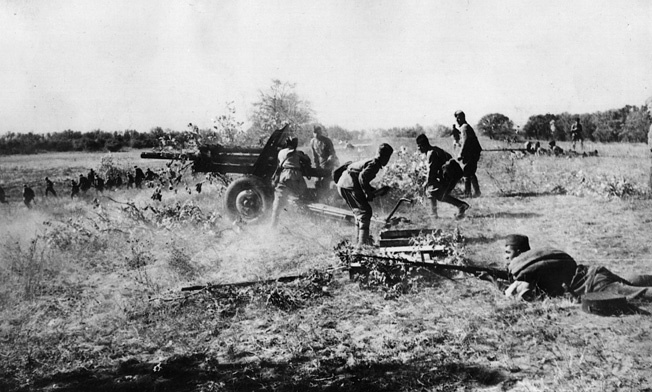 When attacked by Soviet close-combat infantry anti-tank units, some Elephant crews tried to fend off the Soviets by firing their MG-42 machine guns through the main barrel. Another nasty surprise was the Central Front’s 12 new SU-152s. The front’s 152mm assault gun unit knocked out seven Elephants and 12 Tigers of Model’s attacking units, earning it the nickname Zveroboi (animal hunter). After a week of round-the-clock fighting, Model’s exhausted Ninth Army was nowhere near breaking into the open, having only penetrated nine miles. 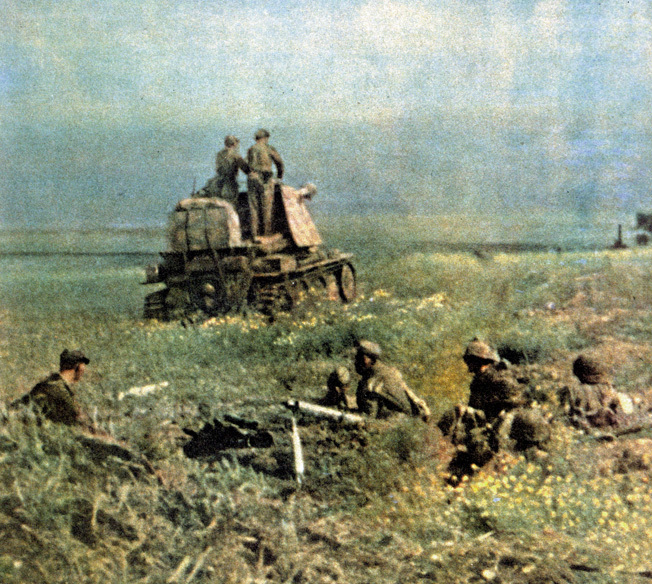 Soviet casualties were heavy, but they did not prevent Zhukov from launching an offensive in the Orel sector on Model’s northern flank on July 11. From then on, Model was hard pressed just to contain a Soviet breakthrough. Zhukov, who had failed to destroy Army Group Center in two previous winter offensives, remained fixated on its destruction. He should have paid more attention to the southern flank of the salient, where Von Manstein’s thrust made dangerous gains. The Soviet defenses facing Novotny and his comrades were as formidable as they were in the north, but the defending Soviet armies had more front line to cover and, unlike Model, VonManstein used massed armor formations from the onset. A bombardment that used more shells than the French and Polish campaigns combined opened the way for Hoth’s 4th Panzer Army, the most powerful concentration of German armor under a single command during World War II. The 4th Panzer Army blasted its way through the defenses of the Soviet 1st Tank Army and 6th Guards Army. The latter’s Guards distinction and the superior equipment that came along with it were indicative of its elite, veteran status. There were many Guards divisions at Kursk, and most of them had earned their distinction at Stalingrad. Fighting with the 48th Panzer Corps on 4th Panzer Army’s left wing, the 200 Panthers at Kursk turned out to be a disappointment just like the Elephants to the north. Although the Panther eventually turned out to be arguably the best tank design of the war, at Kursk it suffered from mechanical problems and inadequately trained crews. By the second day of the battle, the Panthers, armed with high-velocity 75mm guns, were reduced to 50 in number. After five days, there were only 10 left. The bulk of the fighting was left to the old workhorses of the German Army, the Panzer Mark IIIs and Mark IVGs with their new anti-tank rifle side skirts, the assault guns, and a relative few of the feared heavy Tigers, with their 88mm guns, to the defeat the Soviet armor. With their help, the battle-hardened veterans of General Otto von Knobelsdorff’s 48th Panzer Corps fought their way through swamps and streams and overcame mine-infested belts of trenches. Strongholds of camouflaged antitank rifle infantry, sappers with explosives, dug in heavy antitank guns, Soviet T-34 medium tanks, and tank destroyers awaited the German armor. The Mark V Panther medium tank was the German response to the outstanding performance of the Red Army’s T-34. The Panther sported sloped hull armor and a 75mm high velocity cannon. Not only that, but the land sloped upward toward Kursk, giving the Soviets a clear view. Even so, Grossdeutschland managed to reach the outskirts of the villages of Kruglik and Nowosselowka by July 9. On the left wing of the 48th Panzer Corps, however, General Mikhail E. Katukov’s 1st Tank Army held up the 3rd Panzer Division in the woods north of Beresowka. To capitalize on this limited success, General Nikolay F. Vatutin, commander of the Voronezh Front, transferred two tank corps and a rifle division from his reserve to Katukov. That evening, the 3rd Panzer Division had joined the chaotic fighting among the groves and ravines that nearly eliminated the 6th Tank Corps. On July 11, the remnants of the 6th Tank Corps and the mauled 90th Guards Rifle Division pulled back to the west. The 3rd Panzer Division filled Grossdeutschland’s forward positions, allowing the latter to prepare for a renewed push to the north. It was not to be. During the night of the 11th, reinforced Soviet counterattacks flung the 3rd Panzer Division out of its new positions. Although bloodily slashed by the 11th Panzer Division, the Soviet defenders refused to give way. Not only that, but Vatutin gathered his forces for a massive counterstroke to “encircle and destroy the main German grouping penetrating to Oboian and Prokhorovka.” Victory for either side still hung in the balance, for, on the right wing of the 4th Panzer Army, the 2nd SS Panzer Corps was simultaneously on the verge of a decisive breakthrough. SS General Paul “Papa” Hausser’s cream of the Waffen SS armor reached the River Ps’ol. On his left flank, the 3rd SS Panzer Grenadier Division Totenkopf (Death’s Head) crossed the Ps’ol on pontoon bridges on the 10th and immediately engaged the Soviet 52nd Guards Rifle Division and the 11th Motorized Rifle Brigade. To avoid further bridging operations for his heavy tanks, Hausser’s two other panzergrenadier divisions advanced south of the river. The 1st Leibstandarte (Bodyguard) SS Adolf Hitler and the 2nd SS Das Reich (The State) panzergrenadier divisions pushed eastward through Soviet artillery barrages and dug-in tanks of the Soviet 2nd Tank Corps and elements of the 5th Guards Army. Leibstandarte spearheads were already at the outskirts of the Prokhorovka on July 9. The SS formations were aided by initial German air superiority and by Vatutin’s massive, chaotic redeployments, which caused Soviet units to pull back in some areas. Meanwhile, General Herman Breith’s 3rd Panzer Corps’ northward thrust east of the Donets was constantly thwarted by the 7th Guards Army and the 69th Army. VonManstein urged Kempf to have Breith catch up to the 2nd SS Corps and cover its right flank. On July 11, the Tigers of the 503rd Heavy Panzer Detachment ripped through the Soviet 305th Rifle Division and tore into the 107th Rifle Division to its rear. The 6th Panzer Division lunged forward nearly eight miles, and the 19th Panzer Division also made good progress. Although Breith’s armored spearheads were still 15 miles from Prokhorovka, the remaining Soviet defenses were too weak to absorb another German assault. Unless Vatutin immediately rushed in reinforcements, Breith and Hausser would break through to Prokhorovka. 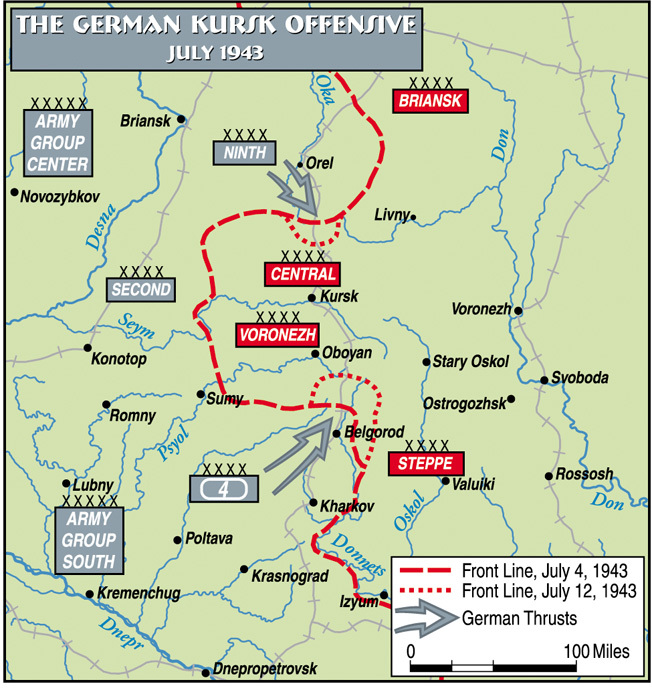 Seven Soviet armies now surrounded the 20-mile deep bulge that the armor formations and the following infantry divisions of 4th Panzer Army and the Kempf Army had bitten into the Kursk salient. To blunt the German advance and at the same time launch his massive counteroffensive, Vatutin rushed in Lt. Gen. Pavel A. Rotmistrov’s crack 5th Guards Tank Army. The 5th Guards Tank Army, along with the already committed 5th Guards Army, was transferred from Col. Gen. Ivan S. Konev’s Steppe Front. Konev’s Front was to lead the planned post-Kursk counteroffensive. 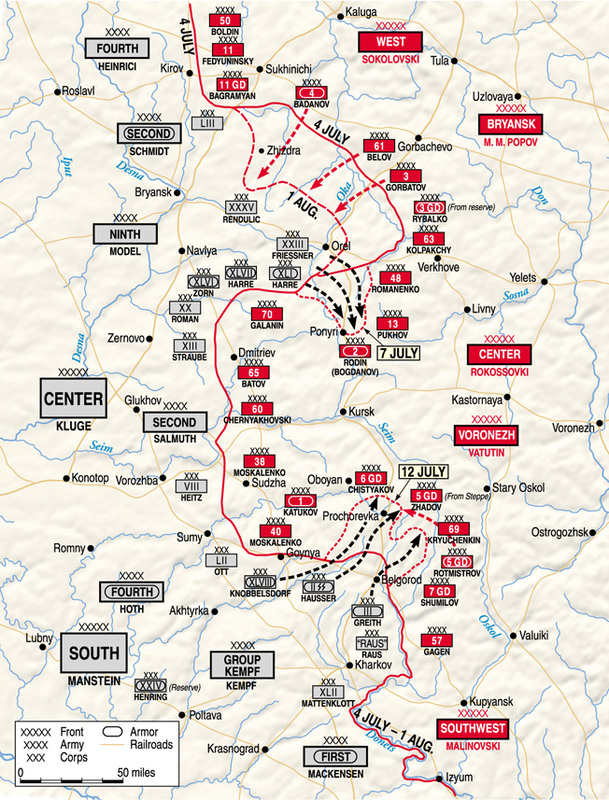 At dawn on July 12, the 121 tanks and assault guns of the Totenkopf Division prepared to shatter the Soviet defenses and advance northeastward on the ridgeline north of the Ps’ol. The day promised to be humid, and clouds hung over the horizon. Brutal, indecisive fighting against three Guards rifle divisions raged throughout the day. South of Prokhorovka, Hoth was on the battlefield watching the ensuing carnage in Das Reich’s sector through a trench telescope. Das Reich was forced on the defensive because the delay of 3rd Panzer Corps exposed its right flank to Soviet attacks. During the day, 50 Soviet armored vehicles drove along one of the balkas, or valley bottoms, past a group of T-34s lined up on the ridge. There were white crosses on the turrets of the T-34s on the ridge. These were captured T-34s of Das Reich, and they suddenly opened fire on the vehicles below. The first Soviet vehicle in line was also the only one equipped with a radio, and it was hit immediately. One after another, the Soviet vehicles exploded in flames. In another area of Das Reich, a T-34 rammed into a field kitchen before being destroyed in close combat. On the 12th, SS 2nd Lt. Hans Mennel, in command of a Mark IV, knocked out his 24th Soviet tank during the fighting. Between Totenkopf and Das Reich, the Leibstandarte launched its attack at 6:50 that morning. Soviet artillery and Katyusha rockets howled upon the German formations. The Leibstandarte’s panzergrenadiers struck eastward, north, and south of the railway line that led northeast toward Prokhorovka. Crewmen in black uniforms and camouflage jackets took last puffs on their cigarettes and climbed into their sand yellow and red-brown Mark IVGs. The 1st SS Panzer Regiment’s 67 tanks revved up their engines. Steel tracks clanged toward purple walls of smoke, flares from German reconnaissance planes, rising above the undulating ridgelines ahead. The smoke signaled a warning that enemy tanks were approaching. The engine noise of the Red Army’s 18th and 29th Tank Corps roared from the direction of Prokhorovka. Hundreds of Soviet tanks in waves of 40 or 50, with Guards Airborne riflemen piled on top of them, rolled out of the town and surrounding area. SS 1st Lt. Rudolf von Ribbentrop, son of the Nazi foreign minister, commanded a company of six Mark IVs, which drove down a slope to aid the hard-pressed panzergrenadiers. Ribbentrop’s company knocked out a handful of T-34s at 800 meters. The Mark IV, the most common German tank at Kursk, was not as fast as the T-34 or as heavily armored, but it had a superior gun and fire control. In the end, tactics and training proved decisive. Soviet infantry, dead or alive, were hurled off the burning tanks. With its infantry seeking cover, the Soviet armor bravely sped on until the tanks of both sides sliced through each other. “There was neither time nor room to disengage from the enemy and reform in battle order or operate in formation. The shells fired at close range pierced not only the side armor but also the frontal armor,” witnessed Rotmistrov from his observation post on a hill. Ribbentrop had turned with the waves of Soviet tanks that swept by him. Soon they were under withering fire from German assault guns and two more panzer companies lurking down the slope behind an antitank ditch. Amid the thick smoke and dust, the jumble of Soviet tanks and wrecked vehicles, Ribbentrop’s Mark IV remained unnoticed by the Soviet tanks around him. “Machine guns firing, we rolled through a mass of [Soviet] troops from behind,” he said. Ribbentrop pulled his Mark IV into cover behind a destroyed T-34 and joined the slaughter of the Soviets tanks trying desperately to cross a bridge over the antitank ditch. “Burning T-34s ran into and over one another. It was a total inferno of fire and smoke, and impacting shells and explosions,” he remembered. A shell hit Ribbentrop’s turret, driving the gunner’s sight into his eye and inflicting a serious head injury. He was able to reach the safety of the German lines after he and his crew had knocked out 14 Soviet tanks. Meanwhile, north of Oktiabrs’kii, the Tigers of SS Captain Heinrich Kling’s 13th Heavy Panzer Company crushed through hedgerows and thickets. Suddenly, a wave of 60 Soviet tanks swept out of a wood less than a mile away. Second Lieutenant Michael Wittmann’s Tiger rocked from the recoil as his 88mm gun knocked out the first T-34. The Soviet tanks fired on the go, rapidly closing the distance. Four Tigers were hit and temporarily crippled. Wittmann’s Tiger shuddered from two hits but remained unfazed although his radio operator received a wound in the upper arm. “Three o’clock, three hundred!” cried Wittmann. A T-34 appeared out of some bushes. It swung its 76.2mm gun toward Wittmann’s Tiger, but Witmann’s gunner, Balthasar Woll, was faster. The 88mm muzzle flashed and blew the turret off the T-34. Captain Hans Ulrich Rudel’s Stukas appeared above the dueling tanks. Oily black smoke spiraled into the sky. Like birds of prey, the Stukas howled down upon the Soviet tanks. Armed with 37mm cannon, the Stukas blasted at the vulnerable Soviet rear armor. Swarms of Soviet Yak fighters appeared, shooting up the slow Stukas. Then, Messerschmitt Me-109 fighters tore into the Yaks until the chaos and destruction on the ground was mirrored in the sky. Wittmann’s platoon of three Tigers pushed on through the storm of steel, through the flames and smoke of burning grass. He had passed Prokhorovka when Kling’s voice rang through the radio, “Achtung! Strong force of enemy tanks approaching from ahead! Many tanks!” Soviet tanks of the 181st Tank Brigade closed in from about a mile away, disappearing into a valley and then reappearing over a rise. The stationary Tigers’ guns opened and maintained a rapid rate of fire. Numerous Soviet tanks were blown to pieces, but the remaining machines kept coming. They had to close to within 800 meters to be able to penetrate the Tigers’ frontal armor. Leading a group of 15 tanks, Captain P.A. Skripkin’s T-34 closed in on Wittmann’s platoon. “Forward, follow me!” he shouted. Skripkin fired a round into a Tiger’s side, disabling it. 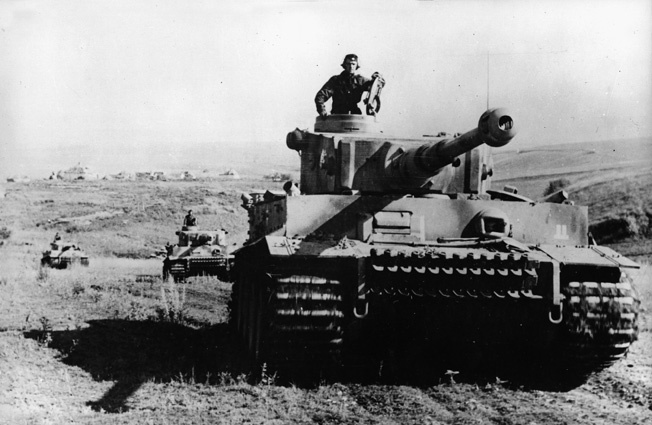 Wittmann’s Tiger responded by pumping two rounds into Skripkin’s tank. Skripkin was wounded, and his crew pulled him out of the burning T-34. The driver jumped back in, and like a flaming ball of fire his T-34 tore down onto SS Staff Sergeant Georg Lötzsch’s Tiger. Lötzsch steered straight toward the oncoming Soviet tank, slammed on the brakes and fired. The 88mm round hit the edge of the turret and ricocheted into the sky. The 30-ton T-34 rammed into Lötzsch’s Tiger, shaking the ground with its impact. Flames engulfed both tanks. Lötzsch kept his nerves and backed out just before the T-34’s ammunition exploded. The Mark Vi Tiger tank, with its 88mm cannon, was perhaps the most feared weapon in the Wehrmacht arsenal; however, the mammoth tank was plagued by mechanical failures and an insatiable appetite for fuel. Despite horrendous losses, the Soviets kept up the pressure. From north of Oktiabr’skii to south of Storozheveo, the battle seesawed back and forth. The Leibstandarte’s efforts to advance were thwarted by packs of Soviet tanks and infantry. The 1st Panzer Regiment was forced back to Oktiabr’skii. By 6 pm, the 181st Tank Brigade, assisted by the 170th Tank Brigade, threatened to sever the link between the Leibstandarte and Totenkopf at the village of Vasil’evka. Meanwhile, at Storozhevoe, Leibstandarte grenadiers reeled under an avalanche of Soviet tanks and mounted infantry. A tank destroyer crewman recounted, “Salvo after salvo of Stalin’s Organs rained down upon our positions, with artillery and mortar shells in between. T-34 after T-34 rolled over the hill … three … five … ten … but what was the use of counting?” At one point Soviet tanks penetrated to Komsomolets, threatening Leibstandarte’s command post and engaging its artillery regiment at point-blank range. By midafternoon the sky broke into heavy showers. Rain sizzled on swaths of smoldering tank carcasses, and roads turned into mud pits. Combat in the 29th and 18th Tank Corps sector ground to a halt. Both sides were too drained by the terrible ordeal to go on. All along Vatutin’s front, the 4th Panzer Army advances on July 12th had been arrested or slowed down, but so had Vatutin’s own offensive. The cost had been extremely heavy. The 5th Guards Tank Army lost about 650 tanks, although only 250 or so of them were total write-offs. Gross’s battalion alone accounted for 90 Soviet tanks, earning him the Knight’s Cross. The 2nd SS Corps lost just over 60 tanks and assault guns completely destroyed. The SS owed part of its success to the one-eyed “Papa” Hausser who “untiringly led all day from the front,” inspiring his troops with “his presence, his bravery and his humor, even in the most difficult situations,” noted Hoth, whose recommendation earned Hausser the oakleaves to his Knight’s Cross. During the night, troopers dug in and prepared for renewed offensives on the 13th. Soviet and German soldiers alike felt that victory could be achieved if, somehow, the last bits of energy could be called forth. The following day, the weight of the battle in the 2nd SS Corps sector switched from the Leibstandarte to Totenkopf and Das Reich. With its remaining 54 tanks and 20 assault guns, Totenkopf continued to advance north of the Ps’ol, engaging two Guards rifle divisions and the 51st Guards Tank Regiment. Totenkopf reached its objective, the Prokhorovka-Kartasshevka road, but was forced to relinquish its gains due to serious attacks on its left flank and the Leibstandarte’s failure to keep abreast south of the river. Northeast of Oktiabri’skii, the Leibstandarte was flung back by airborne troops and riflemen supported by Soviet tanks, antitank guns, artillery, and mines. Rotmistrov related, “ The fire of our Katyushas always instilled terror in the Fascists. Suffering great losses, the enemy was forced to fall back, abandoning the burning tanks and the bodies of his dead soldiers and officers.” The Soviets went on the offensive, but just north of Komsomolets State Farm they were given a dose of the German’s own nebelwerfer rocket launchers. South of the Leibstandarte, Das Reich captured Storozhevoe and reached the outskirts of Vingoradovka, giving the Soviets cause for concern. It looked like Das Reich might link up with the 3rd Panzer Corps, which was rapidly gaining ground due to a daring night coup by Major Franz Bäke of the 6th Panzer Division. A T-34 had led a column of vehicles into the darkness behind Soviet lines. The guards at the trenches must not have looked closely because the T-34s’ markings were painted over and replaced with a small cross. It was one of the score or so of T-34s in German service, and Bäke used it to lead his battalions past the Russian sentries. After six miles or so, the T-34 broke down, “no doubt moved by national sentiments,” Bäke opined. 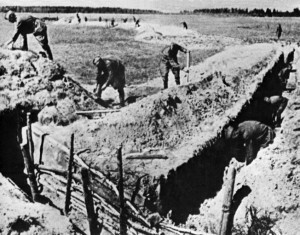 Soviet soldiers labored to dig 6,000 miles of defensive trenches prior to the commencement of Operation Citadel. More than 300,000 Russian civilians contributed to the effort. On crept Bäke’s battalions, past stationary T-34s, their crews sleeping in the grass. A column of Soviet tanks appeared heading in the opposite direction. In the darkness, all tanks looked the same, or did they? He recalled, “They obviously believed [Bäke’s tanks] to be their own tanks returning from the front. Twenty-two tanks passed my unit, almost track to track. But then six or seven pulled out of the column, turned, rolled back and pulled in behind us.” Bäke turned his Panzer to block the T-34s. Although his own command panzer had only a dummy gun for protection, Bäke ordered the rest of his unit to continue and to secure the objective bridge. The T-34s ominously drew up in a semicircle while Bäke and his operations officer slipped out of their panzer. They crept up to the T-34s and attached hollow charges. A handful of infantry was hitching a ride on one of the T-34s. One of them noticed Bäke and raised his rifle. Bäke snatched the rifle from the Russian’s hand and jumped into a ditch. One after the other, three explosions lit up the night. One of Bäke’s tanks knocked out a fourth T-34. German and Soviet machine-gun and tank fire erupted. The startled Soviets withdrew across the nearby Donets Bridge at Rzhavets and blew it up behind them but could not prevent German grenadiers from wading across the river. The bridge was captured and repaired, leaving the 3rd Panzer Corps free to thrust northward. To stop them, General Kuzma Trufanov, deputy commander of the 5th Guards Tank Army, hurled one rifle division, two reinforced Guards tank, Dugades and two mechanized brigades at the 3rd Panzer Corps. On July 13, while the 19th Panzer Division, and behind it the 7th Panzer Division, were trying to move out of the bridgehead, the 6th Panzer Division was busy fending off Trufanov’s divisions around Aleksandrovka to the east. That day, the 6th Panzer Division suffered a heavy blow from friendly fire. A German Heinkel He-111 bomber accidentally bombed 6th Panzer Division headquarters, killing 15 and wounding Bäke and his division commander, Maj. Gen. Walther von Hünersdorf, and 47 other officers. To the west, Grossdeutschland’s northward advance on July 13 was cancelled due to renewed Soviet onslaughts against the 3rd Panzer Division. For a while all contact with the 3rd Panzer Division was lost as the Soviets recaptured Beresowka. On Grossdeutschland’s right flank, the 11th Panzer Division was also unable to press forward due to intense Soviet counterattacks. Rain and muddy roads also hampered the supply of the troops. 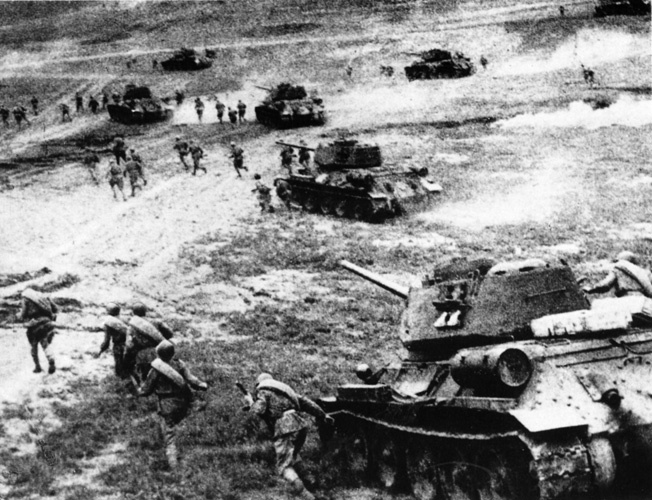 Soviet T-34 tanks, supported by thousands of Red Army soldiers, advance rapidly during a counter-attack at Kursk. Despite the setbacks, Hoth and Kempf continued to have full confidence in victory. Hitler had other ideas. The Führer summoned his army commanders to his Wolf’s Lair headquarters in East Prussia. Hitler told them that the Allies had landed in Sicily on July 10 and that Citadel must be called off immediately to enable the transfer of troops to Italy. Kluge agreed because he was already embroiled in Zhukov’s Orel counteroffensive. 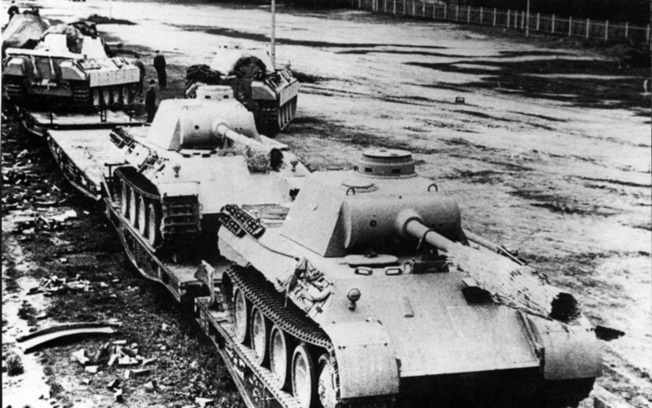 VonManstein, who had originally argued against the whole Kursk operation, pressed for the attack to continue, saying, “To break off the battle now would probably mean throwing away victory.” VonManstein still had the fresh 24th Panzer Corps with 112 tanks in reserve. He wanted to wear the Soviets down through attrition and thereby forestall major Soviet offensives elsewhere. “We were now in the position of a man who has seized the wolf by the ears and dare not let him go,” was VonMellenthin’s impression. Hitler, however, had made up his mind. Four days later he ordered the withdrawal of the 2nd SS Panzer Corps followed by the transfer of Grossdeutschland to Army Group Center. Until then, VonManstein did his best to destroy as many of the enemy as he could. Bäke Himself Knocked out Two Soviet Tanks and an Antitank Gun While His Battle Group Destroyed Another 29 Tanks and 25 Antitank Guns. On July 14 and 15, Grossdeutschland and the 3rd Panzer Division beat back two tank corps, a Guards corps, and Soviet rifle divisions to recapture the territory lost on the 12th. Throngs of Soviet infantry were sent fleeing to the west to be caught in a barrage of murderous German artillery fire. For the Soviets, however, the most dangerous situation was a linkup between the 2nd SS Panzer Corps and the 3rd Panzer Corps. If this happened, the Soviet salient between the two German corps would be closed and the five Soviet divisions therein trapped. Despite their recent wounds, both Bäke and Hünersdorf were back leading the 6th Panzer Division on another attack on Alexandrowaka. Bäke himself knocked out two Soviet tanks and an antitank gun while his battle group destroyed another 29 tanks and 25 antitank guns. Hünersdorf’s luck, however, ran out. A sniper shot him in the head on July 14, killing him. Russian infantry service field artillery and fire small arms at attacking Germans in defense of the Kursk salient. That same day in the Das Reich sector, grenadiers fought house to house in the village of Belenichino, destroying 12 Soviet tanks in close combat. SS Lance Corporal Simon Grascher remained glued to the ground in a storm of small caliber, grenade, and antitank fire. The flanking fire of two T-34s was decimating his company. Spurning the dangers, Grascher fought his way forward. He overcame two bunkers and a number of machine gun nests to destroy one of the T-34s with his last hollow charge. Grascher knocked out the second T-34 by throwing a grenade in the temporarily opened hatch. Grascher was killed in the fierce battles that followed, receiving his Knight’s Cross posthumously. Men like Grascher kept a heavily reinforced Trufanov from being able to do more than slow down the contact between Das Reich and the 7th Panzer Division on July 15. Trufanov did, however, buy the time for most of the Soviet divisions to slip out of the closing German pincers. Indeed, the remaining 27th and 53rd Armies of Konev’s Steppe Front alongside the fresh 4th Guards Tank Corps and 1st Mechanized Corps, with nearly 400 tanks, were closing in on Oboian and northwest of Prokhorovka. How they would have fared against VonManstein’s reserves is a matter of speculation, for on July 17, VonManstein began his withdrawal. Zhukov noted, “Because of the exhaustion of our own First Tank Army and the Sixth and Seventh Guards field armies, the enemy was able to pull his main forces back to the Belgorod defense line by July 23.” Inevitably, most of the German divisions were soon drawn into new battles against Soviet offensives elsewhere. As exemplified by the e´lan of the German panzer formations at Oboian and Prokhorovka, the Germans inflicted deep wounds on the Soviets at Kursk while remaining themselves relatively unscathed. Together, Army Group Center and Army Group South lost 323 tanks and assault guns irreparably destroyed during the Kursk battles. Personnel losses amounted to 50,000 men killed, wounded, or missing. Red Army personnel losses amounted to at least 177,000, with combat losses between 20 and 70 percent of the units committed. Soviet tank and self-propelled assault gun losses amounted to 1,614 vehicles irreparably destroyed. Losses to both the Germans and the Soviets in damaged armored vehicles were much higher than destroyed vehicles. By the time Wittmann’s Tigers disengaged on the 17th, Wittmann himself had accounted for 30 Soviet tanks and 28 antitank guns. From July 5-16, Das Reich alone knocked out 448 Soviet tanks and assault guns against a loss of 46 of its own. The 2nd SS Panzer Corps chalked up 1,149 Soviet tanks and other armored vehicles destroyed. The trend of high Soviet losses against those of the Germans would continue for a long time to come, and often at times be exceeded, as in future battles the Germans were usually on the defensive. Nevertheless, the strategic consequences at Kursk were not lost on the German commanders. “With the failure of our supreme effort, the strategic initiative passed to the Russians. Kursk had been a complete and most regrettable failure,” reflected VonMellenthin. In an attempt to beat back a Red Army breakthrough near Beigorod, German artillery fires at the Soviet spearhead. In the foreground, a Waffen SS grenadier keeps watch over Soviet prisoners. Marshal Alexsandr M. Vasilevsky boasted of 500,000 German casualties. The massacre of Rotmistrov’s 5th Guards Tank Army at Prokhorovka on July 12 was turned into the “Death Ride of the Fourth Panzer Army.” The Soviets claimed 400 German tanks destroyed that day and 3,100 German tanks destroyed during the whole Kursk battle. The reality was rather the reverse, and German morale remained high, both among civilians at home and among the soldiers at the front. Only the relatively recent declassification of Waffen SS combat records and the public accessibility of Russian archival material has revealed the true nature of Kursk: a brilliant tactical victory for the Germans, but a decisive strategic victory for the Soviets. Ludwig Dyck has written on numerous occasions for Sovereign Media publications. He has done extensive research on World War II on the Eastern Front and resides in Richmond, British, Columbia, Canada. Tags Adolf Hitler, Allies, Axis, Battle of Kursk, BM-13 Katyusha, Das Reich, Eastern Front, Erich von Manstein, Friedrich W. von Mellenthin, general heinz guderian, General Wilhelm Keitel, Grossdeutschland Panzergrenadier Division, Gunther von Kluge, Marshal Aleksander M. Vasilevsky, Marshal Georgi Zhukov, Michael Wittmann, Nazi Germany, Oboian, Operation Citadel, Prokhorovka, Red Army, Soviet Union, Waffen-SS, wehrmacht. How about an article on the REAL Lost Battalion of World War II – 551st Parachute Battalion. 95 straight days of combat – stopped the last German attack at The Battle of The Bulge ( Rochlinval ) – suffered 94% wounded or dead as a result – General Gavin then formally rewarded them by Disbanding the 551st !!! My father was 1st Lieutenant John “Milt” Hill; he was one of 100 survivors from a complement of 684 Officers and Men. There commanding officer – Lt. Colonel Joreg – was the only officer killed on the American side during The Battle of The Bulge. I cant take anything seriously when I read about World War 2 and see the words : Russians…. The Russians were not there. The Red Army of the Soviets were fighting. Not the Russian army.